It was only appropriate to pack my favorite Burberry trench for my trip to London! My grandmother gave this coat to me for Christmas several years back and it has been a staple in my closet ever since. There’s nothing more sleek or sophisticated than a structured trench coat, don’t you think? The signature Burberry check print in muted, shimmering shades makes this trench a dressy alternative to my normal coats and outerwear. 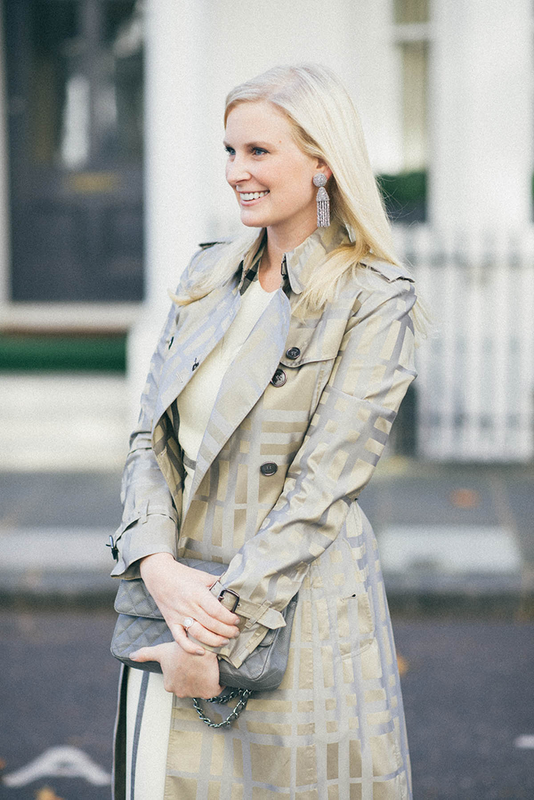 I recently picked up this Phillip Lim dress and realized the ivory + gray would blend perfectly with my trench! You all know how much I love winter white, so the second I saw this dress I knew I had to have it. The modest neckline and length are offset by a fluttering waterfall hem and a fun duo of printed wool and silk. I love it! I’m currently on the hunt for a gray cropped sweater to wear over this dress for a more relaxed look later this winter. Another new piece I picked up prior to my London departure was this pair of Oscar de la Renta tassel earrings. I already own this pair and wear them constantly throughout the summer, but needed a more flexible color that I could wear year-round. I also like the shorter style better – this pair is much lighter and makes less of a statement. I’m sure you already heard, but news of the designer’s death reached me at the airport right before my flight to London – the fashion industry suffered an enormous loss that day. I’ve always worshipped his collections and have been lucky enough to pick up a few pieces over the years. He’ll be forever remembered for his incredible talent and genius in designing for the sophisticated, modern woman. That dress is a beauty. Just gorgeous. This coat is insanely beautiful. I have been waiting to see how you styled this dress! 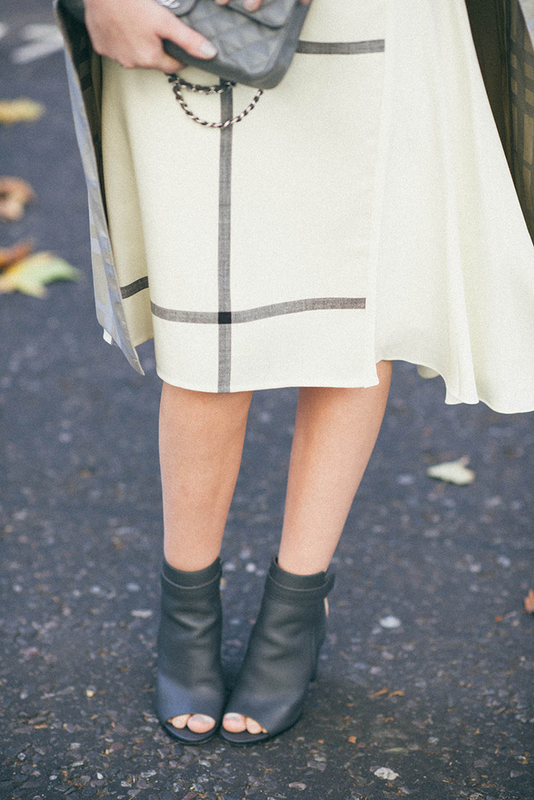 I love the hemline, and the way you paired it with that gorgeous Burberry coat is stunning! 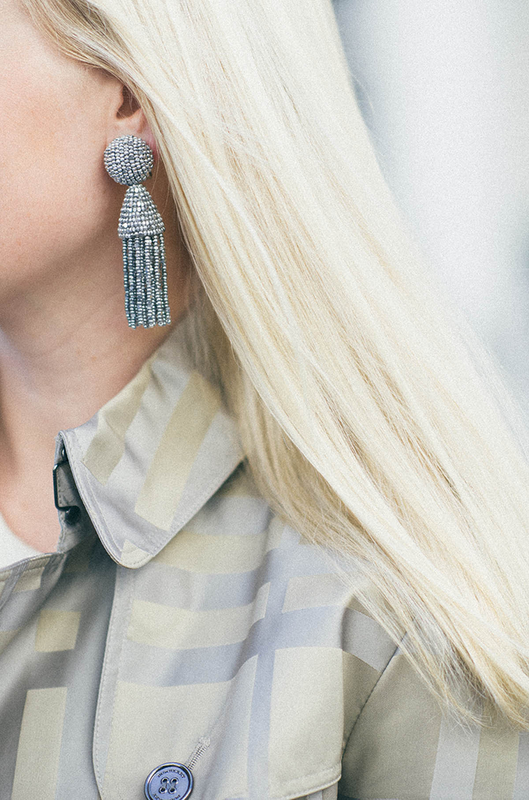 Those tassel earrings add the perfect accent. Gorgeous coat! That is definitely something you’ll have forever. I love that your grandmother gave it to you. You look so stunning in these photos! That dress and those shoes, amazing! You look stunning! Obsessed with your trench! So gorgeous! I love that dress so much. It is such a great style and you styled it beautifully. I’d never think to buy those earrings but they are amazing! 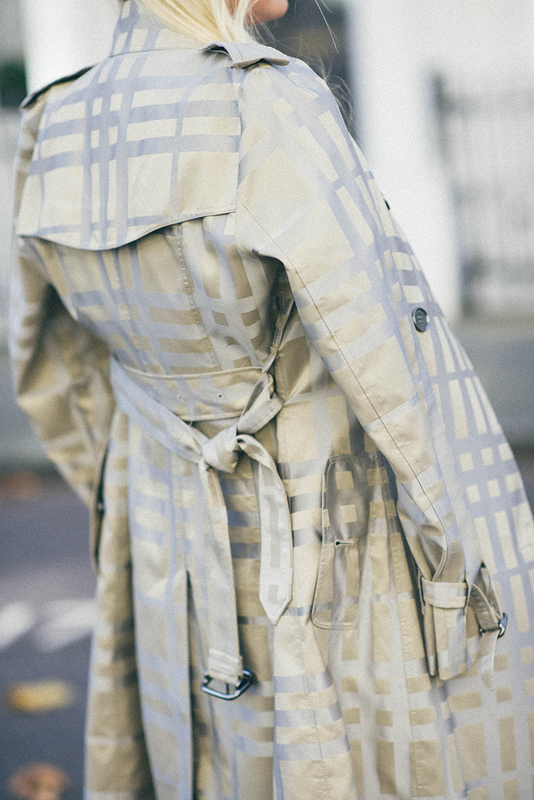 Dying over this timeless Burberry trench! This is one item that has been on my wish list as long as I can remember! You styled it perfectly with that chic and modern Phillip Lim dress! Looking gorgeous per usual! wow! gorgeous look!! I love the softness of the plaid print. and those booties are Everything!!!! that coat is beyond perfection! love it! and those earrings are fantastic! such a pretty dress! and I love those earrings paired with it. p.s. these photos have a film-like quality, so fun! Love this color combo! That coat is so unique and pretty. I’ve never seen anything like it. That trench is fantastic! Love the look! So elegant! I love the metallic shimmer of the coat. Love your trench coat! Such a perfect modern take on a classic! Merritt, this is my new favorite outfit of yours! GORGEOUS! I agree, it’s so fitting to wear Burberry in the fall in London! It’s a beautiful trench coat and the print on the outside makes it stand out from other Burberry trenches. Your grandmother has great taste! Your dress is stunning as well (I thought it was Burberry too at first) and it goes perfectly with the trench. Gorgeous look! Love love LOVE this look! It is so lovely!!! BRAVO! this is so chic!! that coat is just lovely and perfect for the season!! I just found your blog and am obsessed! I love that the trench was a gift from your grandmother. My grandmother also possessed impeccable taste — one of the chicest women to have ever lived. when i first saw this dress i thought of you…is that weird! hahah looks amazing! You seriously always make me want those earrings when you wear them! Such an stunning piece! !